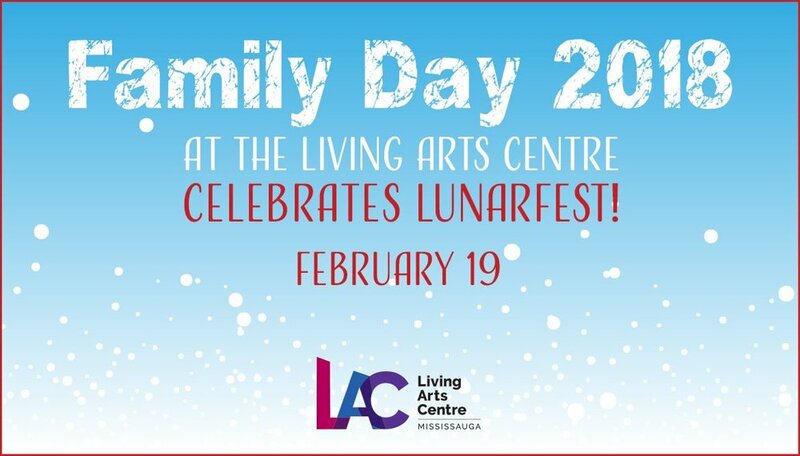 Family Day at the Living Arts Centre Celebrates LunarFest! Have you made plans for Family Day yet? Come join in the fun at the Living Arts Centre on February 19th from 11:00am to 5:00pm! Curling Canada is bringing their Rocks & Rings program straight to you so the whole family can learn a true winter sport – curling! Meanwhile, outside, join the 1st Meadowvale West Scout Group to learn how to build fires while toasting delicious marshmallows. At 12:00pm in Hammerson Hall, join the audience or volunteer to take part in a Live Game Show, ‘Just Like Mom & Dad’ presented by YesTV and MarbleMedia! TV Hosts Sandy Jobin-Bevans and Kylee Evans will host a LIVE question/answer round of Just Like Mom and Dad - an exciting remake of the 80’s hit game show Just Like Mom, and a hugely popular part of Canadian TV pop culture. At 2:00pm, join the audience for our 2nd Annual Family Talent Show! Watch as families show off their talents and are judged by a panel of guest judges. Come watch short films from the National Film Board of Canada between 11:00am and 3:00pm in Rogers Theatre, including: Lights for Gita, The Chinese Violin, Jamie Lo - Small and Shy, At Home with Mrs. Hen and It’s Snow. After that, LunarFest is screening a visually stunning and beautifully shot documentary, The Walkers. This follows choreographer Lin Lee-Chen and her Legend Lin Dance Theatre, exploring the origins of her dance, philosophy, and lifelong pursuit of the perfect aesthetic. Register for the LAC’s Family Day Visual Arts Workshops ahead of time – create a unique glass memento of your child’s hand or foot print in the Cast Glass Memories workshop from 11:00-11:45am or 12:15-1:00pm, or the Family Day Pottery workshop from 10:00am-12:00pm! Throughout the entire day, you can warm up from winter’s chill with delicious hot chocolate, courtesy of Mother Parkers. In addition, the LAC has an excellent lineup of performances on our Community Stage in the Atrium, including last year’s Family Talent Show winners: The Ho Family! Children can also dabble in some hands-on arts and crafts to take home, like their very own Model Magic Olaf from the Disney movie Frozen, OR a personalized button of their favourite Minion from Pixar’s Despicable Me movies, AND MORE! Bring the whole family and enjoy a day buzzing with activity on February 19, 2018 from 11:00am to 5:00pm. For more details, click here.